My husband and I were high school sweethearts. We met in 9th grade and starting dating in 10th. We got married after our second year of college. That was over twenty years ago. There have been ups and downs, as there is in any marriage, but we have a love that has continued to grow throughout the years. The story of us has always been my favorite love story. And if you're married, I hope the story of you and your spouse is your favorite love story! These are stories worth preserving. The early days of our relationship happened in a time before social media and digital cameras. Cell phones were just beginning to become more common- but they didn't yet have cameras incorporated into them. Most of the photos we have from that time were from formal occasions such as school dances. Beyond photos, we had a few other creative ways to preserve memories. Photos are wonderful- but a richer story can be told with the addition of some other precious mementos. I'm here to encourage you to pay attention to these other ways you can preserve the story of your relationship. In relationships, sometimes one person is more sentimental than the other. In my marriage, I'm the one who wants to throw everything away. I don't like clutter...and I overestimate my ability to remember things later on. My husband encouraged me to keep a few things, like cards and notes. I'm happy I listened to him. If you're the one who likes to toss everything, please, let me encourage you to allow yourself a little sentimentality. Your future self will thank you. Today, most of our love notes are via text. It could be a good thing to revive the art of an actual paper and pen love note. I was sorting through some old boxes the other day and I ran across a bundle of papers with a rubber band around them. They were the notes that Derek and I used to pass each other in the hallway on the way to class each day. These were hilarious and cringe worthy but they are a treasure, and I loved seeing his handwriting. These notes are one of the clearest windows into what we were really like over 20 years ago (complete dorks, but dorks in love). Perhaps you don't like to write everything down. That's okay. You can record your thoughts via audio recording. HERE are some tips on how to record an oral personal history. Old cards and tickets to events you attended together, tell a great story. You can keep them in a pretty box. I haven't done tried this idea yet, but I want to. Ask each other a few questions about your hopes and dreams for the future and write down your answers. Describe a typical day in your life together, what you love about each other, etc. Include a few trinkets that might describe what your life is like right now, (for example, a grocery list, a receipt, a drawing, favorite candy, a perfume sample, and pictures) put everything in a box, label it with the current date, the date it can be opened, and seal it. Visiting the Big Island of Hawaii is one of my favorite memories that I share with my husband. Souvenirs don't have to be kitschy and you don't have to buy them at high tourist prices when you're traveling. You can wait until you get home and order something online. What's most important is that it's meaningful and associated with a sweet memory. I was recently gifted with one of these beautiful personalized bracelets from Gifts.com. 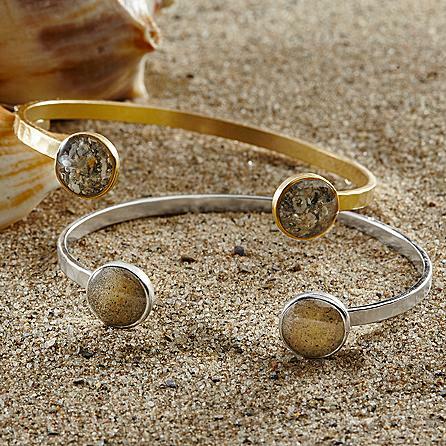 These bracelets come filled with sand from the locale of your choice. I chose to have mine filled with black sand from the Big Island. A marriage is made up of millions of tiny moments, a beautiful mosaic of memories, some happy, some not so much- but they make up your love story. Your love story is worth preserving. We get to choose which memories we want to make a special effort to preserve. I like to remember the good moments in my marriage. I hope these 5 creative ways of preserving romantic memories (beyond photos) were helpful to you. Perhaps this post sparked some additional ideas. I'd love to hear about them in the comments. My sweetheart and me at a friend's wedding, a happy memory. If you liked this post, you might also be interested in another a guest post I wrote at Arabah Joy's blog called, 5 Creative Ways To Preserve Childhood Memories.